Battlefield 4 is the next iteration of the massively popular FPS series, set for release before the end of the year on pretty much everything except the Wii U and handhelds (Sorry Nintendo). I had the opportunity to play a game of Conquest on one of the new maps on PC at Gamescom, but seeing as how I've never played Battlefield on PC before I automatically grabbed the Xbox 360 controller, read on to see my impressions! Battlefield 4 was easily drawing some of the largest crowds at Gamescom, even more so than the PlayStation 4 and Xbox One stands which was surprising to me because I figured people would want to try out the new systems over any current gen titles. 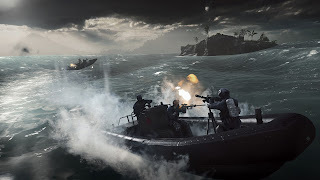 If you've never played Battlefield before, the game is a first person shooter with a military aesthetic and conquest mode is just one of the gametypes on offers and it's one that Battlefield easily does the best. Conquest involves each team being allocated a set amount of tickets and every time you or a teammate are killed, your team loses a ticket. As well just just running around shooting at each other, there are a number of capture points, all you have to do claim these is stand in the area to capture it and raise your teams flag to show who has that zone. If you have more flags than the enemy team, the opposing team also loses tickets as the game goes on, so there's a reason for doing the objectives. If you have played it before, you'll be pleased to hear that Battlefield 4 is pretty much the same beast as Battlefield 3, but now everything looks sharper and the environments are even larger than before. Some new features are the show stopping, massive scale terrain deformation that can completely change any battle situation. I played on the recently revealed "Paracel Storm" map where a huge battleship crashes onto land, changing the layout of the level itself. It's an interesting mechanic that seems to be the natural progression for Battlefield, seeing as how they've already nailed the whole aspect of destructible environments, what with previous games in the series already letting you destroy walls and even take down entire buildings. The only issues that I ran into was how the controller was set up, I guess someone before me messed about with the controls as the button layout was slightly different and I couldn't seem to use any of my equipment, and every time I tried to tag an enemy with the back button, my whole HUD would just randomly disappear which made telling my team and the opposing one apart rather difficult. Also seeing as how all the menu's were set up for PC play, I had to keep switching back to the mouse to be able to select where I was going to spawn, as there was no option to use the controller to do that. Overall though, I was thoroughly impressed and I'm looking forward to getting this when the game is released in November. 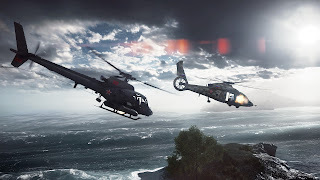 As a side note, if you're a member of Battlefield Premium with BF3, you'll be getting access to the BF4 Beta which is happening in October on whatever platform you already have a Premium membership on. Had a chance to check out the game?